SOPREMA opened its first factory in China, Jiangsu province (Changzhou), on March 7th, 2017. Soprema executive vice president for America and Asia M. Richard Voyer, the Consul General of Canada in Shanghai Mr Weldon Epp, the Director of Quebec government offices in China Mr Jean-Francois Lepine, the Economic head counsellor of the French consulate in Shanghai Mr Raphael Pequignot and Changzhou Mayor Mr Ding Yibo attended the ceremony. 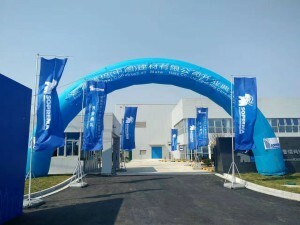 Soprema has exported to China since 1999 and settled a subsidiary in 2004. It carried out several flagship projects such as the green roofs of Beijing Bird’s Nest and Shanghai Natural History Museum. Changzhou facility will play a key role in helping Soprema better respond to Chinese construction market’s tremendous demand. Besides, it will boost the group’s growth in the Asia-Pacific Region, where Soprema already has four offices – Hongkong, Singapore, Australia and Vietnam. This first investment phase, which focuses on PVC production, also includes a technical training center, dedicated to enhancing the quality of waterproofing solutions’ implementation and integration in architectural design.